Best Whey 900g + Creatina 150g Black Skull--super Promoção!! Best Whey Athletica 900g - Super Oferta Frete Gratis! 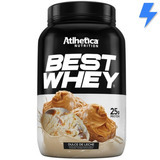 3x Best Whey Protein 900g Athlética Postagem 24 Horas!